It’s been exactly two years since Katie and her aunt and uncle opened the Honeybee Bakery. After a dinner celebrating the bakery’s anniversary, they meet Aunt Lucy’s friend Orla, who has been telling the fortunes of locals and tourists alike for years. The next day, Orla meets with what seems like a terrible accident, but Katie’s witchy intuition tells her it was something more far more sinister. 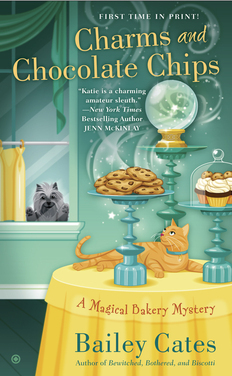 When the bookshop next to the Honeybee Bakery hosts a signing for a Savannah radio celebrity's new self-help book, magical baker Katie Lightfoot is happy to provide some delectable desserts. The whole spellbook club is going to the event, curious about the book (and maybe to sample some goodies), but the final chapter comes too soon for the author when she is found dead at the event. For magical baker Katie Lightfoot, the only way to beat the Savannah summer heat is to whip up some cool treats for the Honeybee Bakery’s patrons. But when a meeting of the spellbook club is interrupted by a stranger collapsing on the floor of her shop, mumbling something about a voodoo talisman, Katie drops everything to begin investigating. When Hollywood invades Savannah’s historic district to film a Revolutionary War movie, magical baker Katie Lightfoot tries to stay away from the action, but when the caterer is fired, the Honeybee Bakery comes to the rescue. Soon there's a dead body, a spooky psychic predicts Katie will find the killer, and the charming baker steps in to sift through the suspects…before someone else winds up on the cutting room floor. 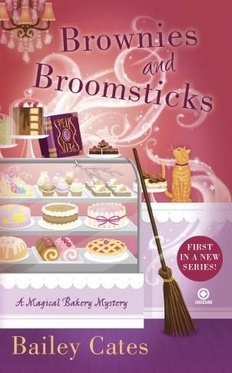 Between brewing magically spiced treats at Honeybee Bakery and volunteering with a local conservation group, Katie Lightfoot barely has time to see her firefighter boyfriend, Declan McCarthy, much less delve further into her destiny as a witch. But avoiding her fate won’t be as easy as whipping up a new recipe—especially when Katie finds herself once again mixed up in murder. As a new witch Katie Lightfoot is still getting used to casting spells, brewing potions, and mastering her magical powers. But that doesn’t mean she can’t find time to enjoy a picnic with firefighter Declan McCarthy…until she stumbles upon a corpse. The dead man’s tattoo reveals he was a member of a secret society—and it turns out he's missing an object that was very important to the group. When Katie learns the killer was after more than the man's life, she and her Aunt Lucy set off in hot pursuit of a killer. 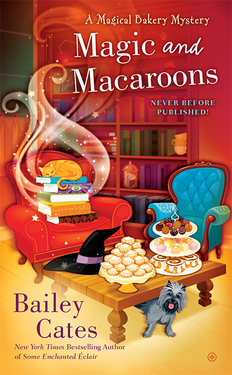 In the Honeybee Bakery - named after Lucy's orange tabby - Katie notices that her aunt is adding mysterious herbs to her recipes. Turns out these herbal enhancements aren't just tasty - Aunt Lucy is a witch and her recipes are actually spells! 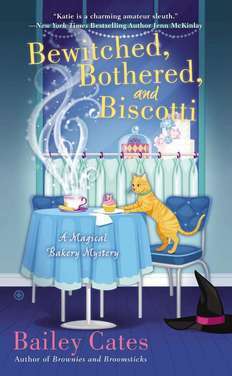 "Savory and suspenseful, Brownies and Broomsticks introduces Katie Lightfoot, a sassy new heroine, to the world of cozy mysteries. 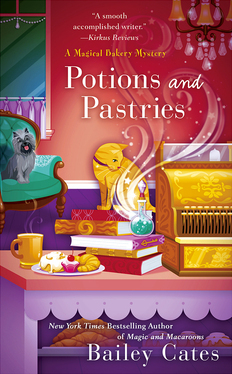 Katie is a charming amateur sleuth, baking her way through murder and magic set against the enchanting backdrop of Savannah, Georgia. With an intriguing plot and an amusing cast of characters, Brownies and Broomsticks is an attention grabbing read that I couldn't put down." 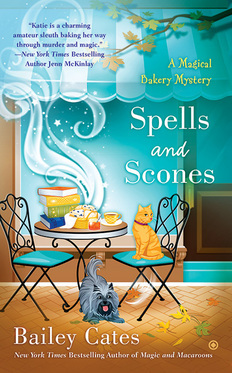 "Let Cates cast her spell over you with this charming debut series entry that brings in the paranormal but never forgets the warmth that cozy readers often request." 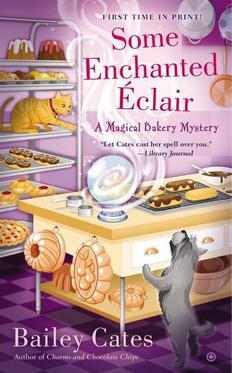 “Cates is a smooth, accomplished writer who combines a compelling plot with a cast of interesting characters that are diverse and engaging without falling into simplistic stereotypes…A charming addition to the food based-cozy mystery repertoire, while the story’s magical elements bring a fun, intriguing dimension to the genre." "Ms. Cates has most assuredly found the right ingredients...a series that is a finely sifted blend of drama, suspense, romance and otherworldly elements." "A very comfortable world with interesting characters and a well-paced plot that will leave readers anxious to return to Savannah and the Honeybee Bakery."